The first No Man's Sky patch bring a host of changes, and those playing early may want to delete their saves so they don't miss out. No Man's Sky releases this week, with the console version due tomorrow and the PC version coming on Friday. The patch will launch alongside both versions, and will bring significant changes to the game. The changes are so involved that players who have gotten their hands on an early copy will have to delete their saves to see them all. 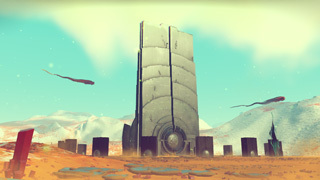 Studio founder Sean Murray announced the patch in a post on the game's official website, and he stressed that the need to delete saves was unique to this patch, saying, "We highly recommend deleting your save if you have played before updating your game (we won't do this in future, but it's a day zero update)." The servers were wiped on Sunday, and again today. Murray said that the new update would be available to reviewers today once it exits the submission process. There are now three different paths to take throughout the game. Early in the game, you make decisions that will have "significant impact" on your experiences in the later game. To experience these, you must start the game on a fresh save. Universe generation rules have been changed, so planets have moved, biomes have changed, and even galaxies look different. Galaxies have also grown, and in some cases are now 10 times larger. More creature diversity, both in type and density. More planets, including "dead moons, low atmosphere and extreme hazardous planets." The exploit that allowed completing the game in approximately 30 hours has been removed. The full list of changes is lengthy, and can be found in the official blog post.